Thanks to Vic the Vicar for his comment on yesterday's blog post. It is always great to read comments, indeed reading other people's reactions to my ramblings is often more fun than the rambling itself! I wasn't planning on blogging this morning but as Blogger has seen fit to repeatedly refuse to let me respond to comments, I thought I would write another dog related post in response. We have ended up (by chance rather than by design - although I think God is more likely than chance personally) with two very amusing and slightly dotty dogs. We adore them both even though their actions are sometimes beyond our understanding. Bobby is only 9 weeks old, he is forgiven for chewing, mouthing, weeing in the wrong places, etc. These are not personality quirks they are just the behaviours of a puppy. Monty on the other hand is, at least physically, an adult dog. He has many idiosyncrasies (although we do not deny our part in creating them as we have raised him). To answer Vic's question, Monty does indeed sleep upside down. This is his favourite and most relaxed position - a position he rarely adopts when we are in new and unfamiliar surroundings. It is a little off putting, especially to guests or when one is eating, as in this position all modesty is lost and his "gentleman's area" is displayed in its limited glory. In answer to the question about opening doors, no we haven't witnessed Monty open a door. He has been known to move the table we use to block the stairs when we are all in bed. The reason the table is there in the first place is due to Monty being completely incapable on letting us know when he needs to go to the toilet. If he is desperate he will push past and go downstairs to leave a puddle by the back door. These days I have become accustomed to this, and so like a parent alert for their child's cry, even the slightest movement makes me leap out of bed and rush downstairs to open the door for him. Very relaxing....NOT. Many years ago, when I lived at home, we did have a problem with animals opening doors, but even then it was discovered the cat and dogs were working as a team. The cat threw himself on the door handle to release it and the dogs pushed, and all hell broke loose! Mum asked a friend to help, and for years all our door handles were vertical! 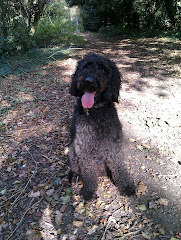 Monty loves to run off the lead and has brilliant recall, if we happen to have a ball. He would play fetch all day given the choice. He is occasionally distracted by squirrels or rabbits and careers off after them at speed only to return minus the ball which he has dropped in his excitement. Then some frantic searching later and we can continue on our way! He loves to swim and is now quite accomplished and he doesn't chase the ducks (unlike one of my parents labs). However he hates the bath! Monty sleeps on the floor in our bedroom on his mat, and at the first sign of us stirring he jumps up on the bed and goes back to sleep. He's very fond of sleep. Monty is an accomplished thief, although again I have met worse. These days he is only likely to steal if he feels neglected. The kitchen sides have to be completely cleared before we can go out and leave him otherwise he will clear them for us. We came back from church one Sunday morning to find he had chewed and spread all over the floor a very large pack of filter coffee - it was everywhere! He is also partial to sponge scoureres, tea towels and the odd plastic dinosaur. The first time he ate a marble I was very nervous untill it passed safely through - and no Mother I did not disinfect it and return it to the child!!! He has reeked some damage in the study as a puppy, but only destroying an old chair. No cloak eating here! A childhood dog once ate my Dad's Parson's Pocketbook - He caused weeks and weeks of confusion and phone calls to funeral directors and wedding couples which included the phrase "Sorry, the dog ate my diary...no, he did really eat my diary!" We have got off lightly so far. I hope you enjoy the dog antics, no doubt I will have more as Bobby grows - it's double trouble now! Tattoos - Love 'em or hate 'em? Fragrant or just plain smelly?